LED Photo Rejuvenation Treatment stimulates collagen and elastin production for firm skin, with a reduction in fine lines and wrinkles. 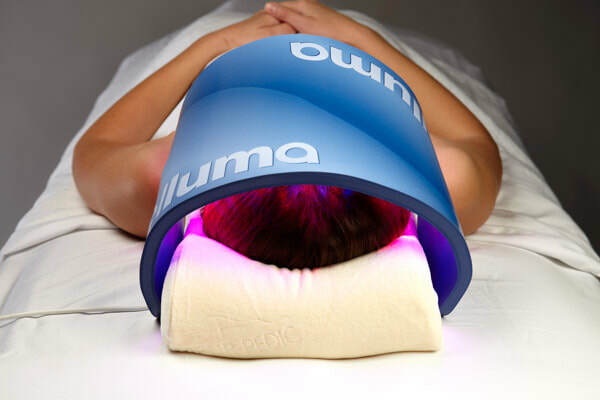 It produces immediate, intermediate and long lasting results through use of LED (light emitting diodes) that stimulate your skin's natural production of collagen and elastin. It's like activating your skin's own hidden repair system! Chlorpromazine (Anti-psychotic), also know as Thorazine, Chlorpromazine HcL, Sonazine. You can be treated if the medication has not been taken within the last eight days. Griseofulvin (Anti-Fungal), also known as Grifulvin V, Fulvicin P/G, Gris-Peg. You can be treated if the medication has not been taken within the last five days. Isotretinoin (Anti-Acne), also know as Accutane. You can be treated if the medication has not been taken within the last six months. Tetracycline’s (antibiotic) also known as Helidac, Terra-Cortril, Terramycin, Sumycin, Tetracycline HcL, Bristacycline, Achromycin V, Actisite, Tetrex, Doxycycline, Ciprofloxacin. You can be treated if the medication has not been taken within the last five days. Tretinoin (Anti-Acne), also known as Retin-A, Renova, Atralin, among others. You can be treated if Tretinoin is used only at night. Methotrexate (Anti-Arthritis & Anti-Cancer), also known as Methotrexate Sodium, PF & LPF, Mexate-AQ, Folex, Trexall. You can be treated if the medicine has not been taken within the last three days. Amiodarone (Anti-Arrythmic), also known as Amiodarone Codarone x, Pacerone. Treatment can be administered only with your physician’s written permission.